AJAX Hosting :: HostForLIFE.eu :: How to Work With PHP and MySQL? In traditional web applications, the browser sends a request to server, server processes, send some data back to browser and then it is rendered by the browser. But meanwhile, when server is processing, user has to wait. This, needless to say, does not provide the user with a good experience. Ajax, helps to get rid of the issue. It makes the user's interaction to the application asynchronous. 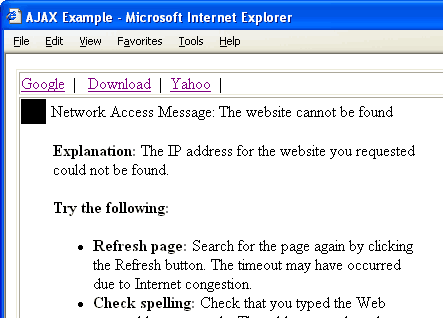 User interface and communicating to the server goes hand in hand and without waiting for the server to come with the processed data or without reloading the webpage, the user interface responds to user's action; greatly improving user experience. In this tutorial we will see how to make Ajax work with PHP and MySQL. We will create a small web application. In that, as soon as you start typing an alphabet in the given input field, a request goes to the PHP file via Ajax, a query is made to the MySQL table, it returns some results and then those results are feteched by Ajax and displayed. You need to make MySQL table. The structure of the MySQL table we use. We have to add <div id="suggestion"></div> bellow the input field whose id is book. Now we set the value of the string to be displayed within the div whose id is 'suggestion' as 'responseText' property of the XMLHttpRequest object. 'responseText' is the response to the request as text. 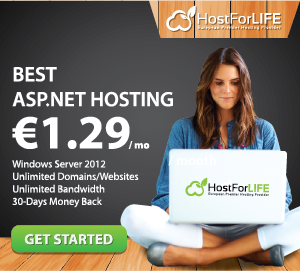 HostForLIFE.eu revolutionized hosting with Plesk Control Panel, a Web-based interface that provides customers with 24x7 access to their server and site configuration tools. Plesk completes requests in seconds. It is included free with each hosting account. Renowned for its comprehensive functionality - beyond other hosting control panels - and ease of use, Plesk Control Panel is available only to HostForLIFE's customers. They offer a highly redundant, carrier-class architecture, designed around the needs of shared hosting customers. European Ajax Hosting UK - HostForLIFE.eu :: How to Make Custom Alert Message with Ajax? Add the user control file and ajaxtoolkit reference in your project. Write the following code in ascx file. <cc1:ModalPopupExtender ID="mpeMessageBox" runat="server" DynamicServicePath="" Enabled="True"
Your message box is ready, now you need to call from the aspx page where ever you need to show the message. Ajax Hosting UK - HostForLIFE.eu :: How to call ASP.NET Page Method using jQuery AJAX ? URL: A string containing the URL to that the request is sent. ContentType: By default we've got to use "application/x-www-form-urlencoded; charset=UTF-8", when we sending information to server we've got to use this content type, that is okay for many cases. Data: data send to be server, if data isn't a string it’ll be converted to query string. DataType: the type of data that you are expecting back from the server. // Add the page method call as an onclick handler for the div. Today, I'm gonna tell you how to solve the problem when JQuery only send partial data to AJAX Post. Maybe you've found that when executing the AJAX call, only part of the data is passed to the server and the rest vanishes. You usually see that some or all of the parameters you tried to pass are missing or cut in the middle. It's because JQuery uses ‘&’ as a separator between the parameters. If you have a ‘&’ within your key or value parameters, then the JQuery AJAX request gets really messed up. Try our AJAX with Free ASP.NET Hosting today and your account will be setup soon! You can also take advantage of our Windows & ASP.NET Hosting support with Unlimited Domain, Unlimited Bandwidth, Unlimited Disk Space, etc. You will not be charged a cent for trying our service for the next 3 days. Once your trial period is complete, you decide whether you'd like to continue. The most difficult part in writing AJAX code is to handle errors and exceptions. Session timeout is one of the most trivial error that one needs to consider while creating an AJAX enabled application. In this post, I will show you the way of handling session timeout errors server HTTP errors in AJAX. Normally, we use AJAX to deliever HTML content that we put in a DIV or SPAN tag and display it on screen. But suppose the request that we sent using AJAX was generated an error due to session timeout then the session timeout screen will be shown in DIV tag. Any error generated by server let say http 404 error or http 505 can lead to display such error in our display DIV. In short, create a status field in your JSON script or a status tag in your XML which will describe the status of the request. I am looking for some more ways of checking session timeouts in AJAX. Kindly let me know if you have a good solution. HTTP errors like 404, 503 are sometimes tedious to handle using AJAX. There is a simple trick to solve this problem. First let's see simple AJAX handler function that you use to get response XML/text through AJAX. Normal AJAX handlers has a if to check readyState and if it is 4 (response arrived state) then you will get the response from xhr.responseText or xhr.responseXML. AJAX’s XMLHttpRequest object has attributes to check the status of your http request. You can use two attributes: status and statusText for knowing this. Thus by checking status attribute from your AJAX xhr object can solve your problem. At the end, if status is not 200, you may not want to update your DOM with the ajax result and display some error message on your web page. Ajax Hosting UK - HostForLIFE.eu :: How to Edit the GridView Row Values in ASP.NET with Ajax ? <asp:GridView ID="grd" runat ="server" GridLines="Both" BorderColor="#4F81BD" BorderStyle="Solid"